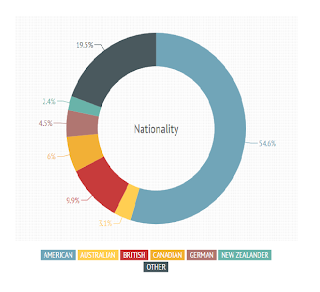 While in New Zealand, we do have much survey on BJJ, I came across this awesome research. Please check out their website for more info, I just posted a few information from one page only. Hopefully, it will help you understanding your students better. 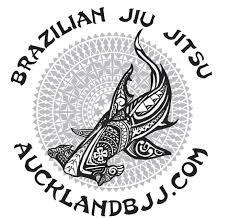 This is a topic that is not so relevant to Aucklandbjj.com because both instructors have a full time jobs and teach as a hobby. We are happy running our little club and increasing our students base is not our main priority. This is not how we put food on the table after all. But thought the years, I have seen BJJ schools growing and some others declining within the same city and country. The question was always: why? Who can we blame? I am not a big believer into creating a fake image or even worst trying to convince a paying customer of signing up for something that he does not want or will not motivate him. 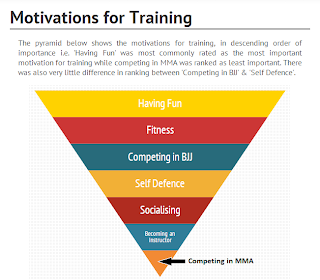 If having fun and being fit is the most important, but you insist on MMA and competing BJJ, you are likely to have your customers running away as soonest their contract is over. The first thing that striked me was that having fun was the main motivation and becoming an instructor and competing in MMA was the last motivations. It think it shows the maturity of the BJJ players that have completed that survey. I assume that the survey was completed by members of Internet forum like sherdog grappling forum aka F12. Can I apply or assume that such motivations for training is applicable for our New Zealand market? The median "man" of the survey was a 30 years old blue belt 2 stripes that trained for 3.5 years and competed 1-2 times per year. Obviously, that would not be median "man" for NZ but one can easily see that if you want a successful club with satisfied customers, you will need to meet their needs/motivations. So instead of trying hard to give the TUF image to attract the MMA fan and even the self-defence and sport competitor, we should concentrate on having fun and fitness first. So do not become a fossil and stop riding the popularity of the UFC, recognise what are the main motivations of your students and you will attract the right people but most importantly you will retain them as you meet their motivations. If you think that your students are to compete in MMA or compete BJJ, you are in for a big disappointment and your club will eventually fail.